Out of all the podcasts led by YouTube stars, we’re particularly partial to Ear Biscuits, hosted by the inseparable duo of Rhett McLaughlin and Link Neal. Each week, we will bring you a recap of the latest Ear Biscuits episode, as well as an invitation to listen in and join the conversation. As YouTube turns ten, content creators who began their careers on the platform as teenagers are progressing into adulthood, and their fans can watch them grow up in real time. No one better exemplifies this phenomenon than Charlie McDonnell. The 24-year-old Englishman went viral on YouTube shortly after his 17th birthday, and he has been making videos ever since. 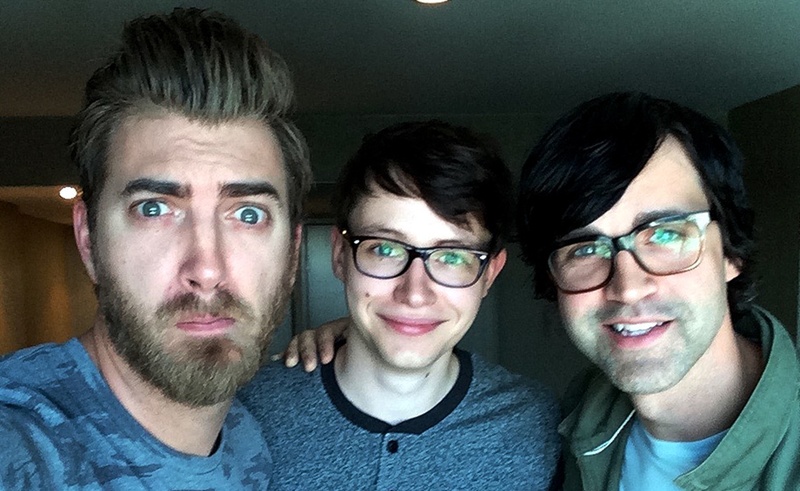 His journey from goofy teen to well-rounded young filmmaker is an intriguing story, and he discussed it on the latest episode of Rhett & Link’s Ear Biscuits podcast. The initial result was a string of videos that are now private on his channel. As he explains it, “they’re just really embarrassing things i would prefer people not to see.” The video that first put him on the map was, in true English fashion, a video about tea. McDonnell succeeded as one of YouTube’s first vlogging stars; he ended up becoming the first creator in the UK to achieve one million subscribers. Along the way, collaborations have been key. He has been a regular participant in the annual Project For Awesome charity drive; of the Vlogbrothers, who run that initiative, he said “I feel like they’ve always been very good role models.” More recently, he has collaborated with his girlfriend, Emily Diana Ruth. He edited “Cold,” the short film Ruth created alongside New Form Digital. The latest format McDonnell has adopted is the daily news show, which he is exploring on a secondary channel called Cereal Time. Once again, it’s an experiment for McDonnell, who is always looking for new ways to engage with his viewers. On Cereal Time, which is mostly shot in one-take, he’s “a bit more of myself than I am on my main YouTube channel.” The result is a show that aims to be more “authentic” than a typical vlog. As McDonnell’s YouTube career enters its ninth year, we can only expect him to continue rounding out his video presence. Beyond what we’ve discussed here, there are plenty more insights in his full hour-long Ear Biscuit. Check it out below, on Soundcloud, and on iTunes.